Can I use Nutraid before committing? It is important for us that you try out the software yourself to be sure it suits your needs. For a free demo please contact your local representative by phone or mail, or fill the “Demo Request” form, and we will get back to you shortly. A free 30 day trial is optional upon request. What are the advantages to a subscription-based license? Companies with more than 25 products will benefit the most from Nutraid annual subscription-based price plan. You get unlimited access to add and manage all your recipes, create new product labels, and update and improve your recipes, with free software updates. For more information on pricing and product packages, please contact your local Nutraid representative or contact us at contact@nutraid.com. Can I pay by recipe or product? You can purchase Nutraid license either per product, or unlimited annual subscription. Designed to suit new or very small manufacturers, Nutraid enables you to start with 5-product package, and expand as you go. All Nutraid licenses include free software updates. Additional discounts are available for longer subscription periods and bulk purchases via product packages. How does Nutraid comply with EU and US legislations standards? Nutraid nutrition facts labels include the required nutritional values of your recipe, ingredient and allergen declaration, vitamins & minerals, RI and QUID, according to EU 1169/2011 new regulations law on food information to consumers, and FDA food labeling regulations. What is the source of your nutrient data? Nutraid Main data sources include the official McCance and Widdowson (or CoFIDS) and the USDA databases. We also use INRAN, Ciqual, and our own data sources. How are allergens added to my labels? All our ingredients are tagged with their allergens, which automatically appear in the ingredient declaration on your label, in EU1169 or US formats. If you add your own custom ingredient, a pop-up window will open, for you to choose from and tag the relevant allergens, and the allergens that your recipe may contain. Once tagged, these allergens will also appear in the declaration. What computer or operating system do I need? 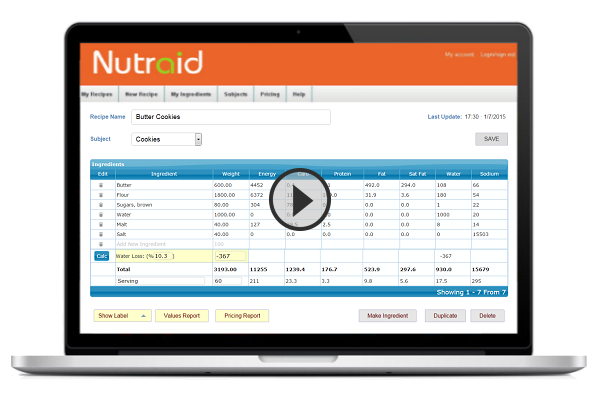 Nutraid is a cloud-based software. It can be accessed from any Windows, Android, Mac or any other computer with an internet connection that supports Web browsers such as Chrome, Firefox etc. Can I work on my recipes using any device I choose?